Can You Really Make Money On The Internet? 5 Success Stories! Last updated on January 15, 2019 By Nat 22 Comments This post may contain affiliate links. We appreciate you supporting Rags To Niches! Full disclosure here. There is certainly plenty of people that talk about it… But can you really make money on the internet? Yes. There is no doubt about that… you can make money online. How much really varies in scope too and, honestly, most people who look for a way to make money online – leave having not made a thing! Not being able to find legitimate training, there is a lot of fluff and blatant scams online -and they get confused by conflicting info. Not really learning the marketing aspect of making money online. Getting tired with it and giving up too early, prior to seeing any success. Having limited success and giving up for a long time and giving up. Hitting technical barriers or difficulties. Finding it difficult to motivate themselves working on their own. Disliking the solitude of working alone. Getting distracted by too many ways of potentially making money, before they have conquered one. This list could literally could go on ….and on…. and on…. There are so many ways that people can and do make money online now. Blogging, (which leads to various ways you can earn – Ads, affiliate marketing, sponsored posts, selling your own products). Buying and selling on platforms such as Amazon or Ebay. Creating products and selling them – on platforms such as Etsy. Having your own E-commerce website. Creating designs and having them printed on products and shipped for you, such as uploading T-shirt designs to POD services, (print on demand). Website testing – getting paid to give your opinion about other peoples websites, on platforms such as User-Testing, (smaller income opportunity). That’s just some of the most popular ways that you can get started online. For the sake of this post though, I’m going to focus on a small bunch of people, who have had some success within a particular area online. By looking at their success, you should be able to see the potential there and hopefully be inspired to give it a go yourself. Too many people do get frustrated when they don’t see results quickly, they think perhaps it’s just a waste of time. It’s not a waste of time, but it DOES take time and considerable effort. Perhaps most importantly, it takes consistent effort too. Now, even though the people I’m going to talk about are making great money online, there are hundreds and thousands more, who are making money online at different levels. There are people at every level, trying to make it work for them! There are plenty of ways to make money online, but I’m going to focus on a five individuals today in different areas of online business – all who have inspired me along the way. And a new one I’ve been introduced to recently…selling T-shirts online! I’m starting off with where a majority of my income comes from at this point, affiliate marketing. There is some cross over here with blogging and affiliate marketing – because affiliate marketing is also be known as a way to make money from your blog, (one of many ways). But affiliate marketing doesn’t necessarily have to be paired with blogging at all, so it can be considered separately from this. Affiliate Marketing Master: Pat Flynn. Affiliate marketing is regularly discussed in the same breath as Pat Flynn, because he’s astonishingly successful within the affiliate marketing field. Although it’s not the only way he’s bringing in income – I think he’d agree that it was the foundation of his online success. After losing his job in the world of architecture, he found success building a little website that he’d originally started to help him pass an architectural exam. Pat discovered that this simple website was generating traffic and found a way to turn this website into a successful income stream, bringing him in thousands per month. From there, he built a new blog called: Smart Passive Income and has inspired thousands of people start building their own online business. He also runs the smart passive income podcast, which is how I personally discovered Pat for the first time. Pat has always been transparent with his earnings an how he’s making his money online, which is quite unusual at his level. As well as his online income reports, there is a graph on his website showing how much he’s made in the last 48 hours and you can see the numbers rising by the minute. Yes… you’re seeing that correctly: $184, 094.67 in the last 48 hours. While Pat Flynn’s income is clearly epic, it’s worth noting that he is one of the most well known names in this space and has a huge following. So, while replicating Pats success would be a challenging, it shows you how making money from affiliate marketing – even if we’re talking a fraction of Pats income, could certainly be a reality. The most important thing you do need though, is an audience. That is something that Pat Flynn has managed to build very successfully. Learn About Affiliate Marketing: Get Started Here! Freelancing is often thought to be one of the best ways you can start making money online, because there is a big demand for freelancers online and such a low barrier to entry. This is especially true if you have a skill to offer – for example; perhaps you’re highly knowledgeable in a certain niche, have graphic design, or SEO skills. Whatever the skill may be that you can provide online, they’ll be people out there looking for workers. One person that I’ve followed for a while that’s had success in the Freelancing space and has been a personal inspiration to me – is Gina Horkey. Gina started her freelance journey back in 2014 and within just six months, was making $4,000 per month! The amazing thing was, this was a side-hustle for Gina, she hadn’t yet even quit her day job. But within eight months of starting on her freelancing journey, she had quit her 9-5. Since then, Gina has created several courses to help people get started in the freelancing world, which can often feel overwhelming when you have no experience. She’s created courses for virtual assistant work, Pinterest virtual assistant work and freelance writing and she has an inspiring blog over at Horkey Handbook. I personally signed up for Gina’s Freelance Writing course and found it incredibly accessible and easy to follow. Freelancing is often thought of as a good way into making your first money online. However, if you’re thinking about freelance writing, getting a blog started first can be beneficial. Prior to having a blog myself, I’m not sure I would have been confident enough to apply for a freelance position. But the great thing about writing regularly for a blog, is that it builds your confidence and your skill set. Perhaps even more importantly, you will build up a big catalogue of writing to showcase, when you do start pitching for work. Pick up a free copy, of 200+ freelance writing niches here. Blogging obviously something I’m doing and while you don’t simply make money via blogging itself, there are various ways you can make money from your blog once you have enough traffic. Key ways that people tend to make money from their blogs is through having Ads on their blog, such as via google adsense or other Ad network, affiliate marketing, sponsored posts, or selling advertising space. While a huge number of bloggers leave big money on the table from not monetising their blogs, some bloggers are absolutely killing it. One blogger that’s been an inspiration and motivation to me, is Michelle from Making Sense Of Cents. Michelle started up a personal finance blog in 2011 – a big motivation behind this, was to pay off her student loan and become debt free. Within just 7 months, Michelle had made enough from her blog to be able to pay off $40,000 in student loans! If you’d like to hear about how she’s doing at the moment, this recent income report shows how she made over $120,000 in a single month, (and growing). While Michelle’s numbers are by no means the norm when it comes to blogging, thousands of people online are making great money with their blogs. For most, it’s having a short term and long term goals, consistently taking action week in week out that has led to me starting to make money online. You also cannot give up when you hit a stumbling blog, suffer burn out, or have a lapse in motivation! Most importantly, you need to enjoy the process. Blogging can be tough, if you don’t have some passion for what you’re doing, you’ll have trouble to stick with it long term. Self-publishing has become huge in recent years and there was a time that it seemed to be a quick gateway to making money online. However, it was soon over run with people putting out books and it’s certainly not as easy as it once was to make money. I was first introduced to Kindle Publishing via Stefan James of Project Life Mastery. Stefan started project life mastery in 2012, and as well as becoming a highly successful blog, he also had some of his first success online with Kindle Publishing. Stefan went on to create a kindle self-publishing course, which I purchased myself. The idea around the course is to target certain niches and keywords and to create ebooks around those ideas – primarily the course focuses on the non-fiction market. Stefan recommends outsourcing the writing and concentrating on the researching aspect. However, of course many people choose to write their own content and publish that. These days, I believe Kindle Publishing works best for people who already have a platform – such a blog, or website. Because, that way you’re already starting with an audience. But even without a blog, some publishers have done well by building an email list by giving away a link to freebie inside their book, (such as a free ebook). By building an email list, you can then market to people in future who are already interested in the type of books you’re writing. I wrote an in depth review – Read It Here. I’d long heard about selling tshirts online with various print on demand sites, such as Teespring or teepublic…. But these websites require you to find your own traffic. For example, I’d need to set up Facebook Ads and drive traffic to my products, which requires additional expense. But one day I was listening to a Podcast episode from the Side Hustle Show interviewing a lady named Elaine Heney, who had made $53k in Tshirt profit in just 10 months on Merch By Amazon. I’d recently heard this opportunity mentioned a couple of times already, so it immediately sparked my interest. The difference between Merch By Amazon and other POD sites, is that many people were having great success on the platform – WITHOUT the need for paid traffic. They were generating their sales completely organically, with no Ads and no promotion. Because Amazon works like a search engine – by targeting long-tail keywords, you could get your tshirt ranked high up in Amazon, for specific search terms. It reminded me a lot of Kindle Publishing – in the sense that you target certain niches and keywords that people will be searching for, but this time it was with Tshirts and not books. The other big plus here was, people who were succeeding were not all designers. Far from it, plenty had zero design experience. That was good news for me, because I’m certainly not a designer and have no knowledge at all of things like Photoshop. Luckily, many of the shirts that do well on Amazon are very simple designs, or text based. There was also the option of outsourcing the designs, which could be done fairly cheaply on somewhere like Upwork. The downside with Merch, is that there is a waiting time involved. Merch by Amazon is invite only and you need to apply…. but you don’t need any special skills or experience to be accepted. I personally signed up with Merch myself and got accepted within a couple of months. I’m still in my first month starting Merch and have made my first few sales already – it’s been quite interesting in comparison to blogging, where it took a few months to make my first couple of dollars! * update Aug 2018 – I have 200+ designs live on Merch, but haven’t been paying it as much attention recently! Merch looks a lot like a numbers game right now and you need to sell a certain number of shirts to tier up to different levels. So, you’re allowed to put up 10 designs at first, then you tier up to 25 designs after 10 sales. You tier up to 100 designs at 25 sales, 500 designs at 100 sales and it increases further from there. I dedicated a post to Merch By Amazon, which explains what you need to know in more detail and I have some useful links on there too – you can find it here. So, That Just About Concludes My Post Today…. But What About You? 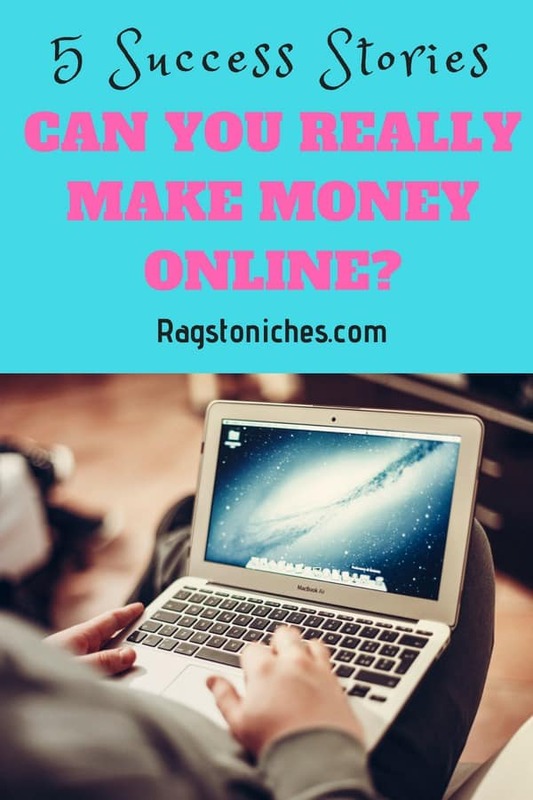 I outlined 5 different ways that you could get started making money online… and some success stories to prove it! If you’re making money online already, what route did you decide to go down? Or if you’re not making money yet… what way appeals to you? The great thing about having a blogging business, is that you can run it from anywhere in the world….. These stories are really motivational. I just want to go back to work. But the one that impressed me more is the story of Michelle. It sounds too difficult to make so much money in seven months. Thanks for sharing, we need to read inspirational posts to keep up the good work. Hi , 7 months is an amazing feat for such success – especially in the blogging world, its highly unusual to be so profitable so quickly. There again, I do regularly hear stories of that. It’s more common when it’s not your first blog though. Thanks for your comment! Your information on these five stories is very motivational. It looks like there are many ways to make money on the internet today, you just have to find what works for you. Each person will develop their own path, that is what I like about the internet today. I found it interesting that an online website was very important to most of these businesses. The affiliate marketing looks like it takes the longest time to take off, but do you think it is the most stable in the long run. I don’t really think of it as stable exactly – I think it can become so, once you grow a decent audience and have an email list built up. Because, then, no matter happens with your website, you still have your email list. But what I like about affiliate marketing, is how it grows over time. You start getting paid for things you did months, or years before. Then one day, you’re being paid for work you first put in weeks or months ago and that can grow. After you grow to a certain point, some websites can take a fairly small amount of upkeep and you can still maintain, or grow your income. These 5 examples are good for newbies to read about, as they show their personal stories of success. I had heard about Michelle, and have been mentioning her often in my blog posts, as an example of a successful blogger. If you spend time on her site, you will learn a ton of things, about the online world. More stories need to be told, of how people have become successful, through their ‘never giving up attitude’. I am one of those determined to make money online, just through learning, and taking action, and perseverance. That was an interesting read. I love that you used stories of individuals as examples for each method of making money online. It makes it much more inspiring. I’ve just started my blog a few months ago. I have yet to make any affiliate sales. But I have made some pocket change in ads. So it’s always nice to read about Pat Flynn and know that success is achievable. yes I think it can be pretty inspiring/motivating to read about real examples. It makes you see what’s possible. I’m pleased you’ve started to make some money with affiliate marketing…. the good thing about that is that it builds up over time. I have just started my website so I have of course not made any income yet. I really like that you made this article as for me it gave me motivation to continue on and be patient and I know other readers will get the same feeling of motivation from this. You’re welcome Samantha and thank you for stopping by and taking the time to comment! It’s so motivating seeing other people who have succeeded online. Plus they all seen like down to earth, “normal” people. If you put your mind to it, you can achieve anything. I’ve recently gotten back into working on my site again after a long break (against my better wishes, I was just really busy with my main job unfortunately! This is an awesome motivator. I love the name of your site by the way. Hi Hannah – thanks for taking the time to comment. It’s great, (and important) for us bloggers to get some motivation along the way and realise what potential there really is. Wow, thank you so much for sharing this. I love reading about success stories and the fact that you listed 5 different ways to earn money online and shared with us a person who has been successful in each one of those, shows myself and others that it is entirely possible to make money online, a full time and livable income at that. We just have to want it bad enough and be willing to learn and don’t let the fear of failure impede us. Hi Brian – it is totally possible, but many people just don’t make it that far, or anywhere like it. The reason being, it’s not easy and does take tonnes of work, just like any other way of building a business. However, I think some people stop because they think the whole, “making money online,” thing – is just a scam. Hopefully stories like this will make people see, that people clearly do make a lot of money online. Great post and perfect timing for me anyway. I have been working on building my website out with writing content and working in the Affiliate Marketing realm, selling products from Amazon, I have not made much yet. I am working on getting ranked in google, I am indexed, but I feel that I am just spinning my wheels here. It has only been about 3 1/2 months since I have my website up and running, should I be worried that this is not for me, or just keep writing content and hope that I get ranked soon? I love reading about the success stories and hoping one day that it could be me that is making it in the online world. You’re right at that stage when many people, (if not most) give up. 3 and a half months is so early – it’s normal to have terrible rankings at this stage and minimal traffic in most cases. If you’ve made any sales at all yet, that’s a good thing! Keep writing and use good seo techniques, which will help you rank better down the road. How to make your first affiliate sale, how to increase google rankings, how to get free traffic to your blog. I enjoyed your article. I always enjoy reading about other people and their success stories online. I loved the way that skills learned in one of those five methods, could be used in at some of the other methods. In your experience, are there any easy ways to be not distracted by other things? With those 5 different success stories, people could get distracted and end up trying more than one of them at the same time, when they might be better off, focussing on one of them. But if so, how would they know upfront which one to focus their attention on? I still struggle with spreading myself too thin sometimes, I wrote about that in a recent post over here. No one will ever “know” for certain that what they’re working on will work out for sure. But certainly, if you know that other people have made money doing the same thing, there’s no reason why you shouldn’t if you’re prepared to put the work in. Often people fail, not because the idea completely failed, but just because they stopped working on it. Even if it is the idea itself, you learn from everything that doesn’t work out… the important thing is to keep going. I guess you need to choose to focus on the thing that resonates with you the most and that you can imagine doing for a long time! As far as sticking to one thing, I think having a fixed schedule can help and set goals that you want to achieve in the short and long term. Am in Ghana, and getting signed up , it says not available in my country. How do i make passive income online? I know this is my second time around your site for the same comment, but I really can’t thank you enough for taking the time to share FIMP, Nat. The project desperately needs it to survive, and unfortunately, it’s just not happening very often. Sincerely, from the bottom of my heart, thank you!! You’re so welcome, I believe in the project! You’re doing a great job. 🙂 If I can help in some other way, let me know.